After a pizza order tipped law enforcement off to their location, affluenza teen Ethan Couch and his mom, Tonya Couch, were arrested in Mexico on Monday. The two were being held in Guadalajara before Ethan was moved to another detention facility in Mexico City and Tonya was deported back to the U.S. Upon landing at Los Angeles International Airport, Tonya Couch was arrested on a felony charge that carries a potential sentence of 10 years in prison. In new photos, Tonya can be seen handcuffed and flanked by U.S. Marshals as they make their way through LAX. Though she still appears to be wearing resort apparel, Tonya's expression is anything but relaxed. The teen's mom is visibly weary as two U.S. 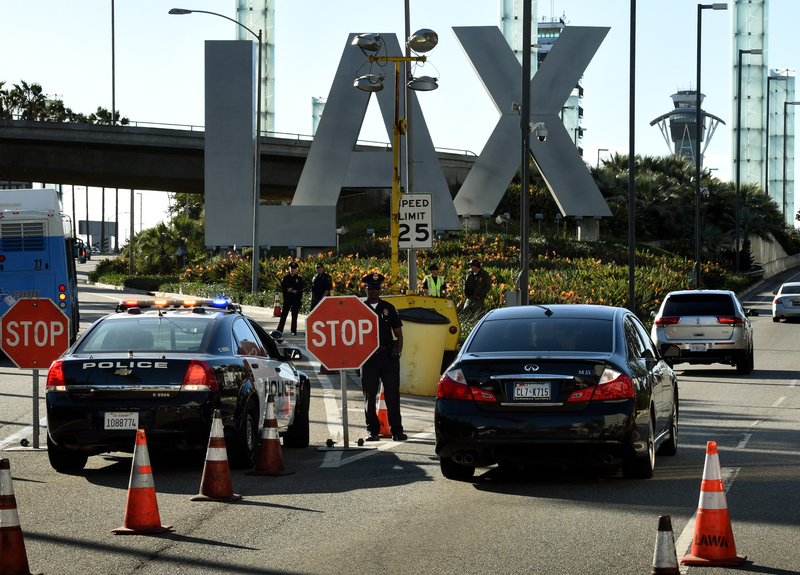 Marshals lead her to an unmarked Dodge Charger parked outside the LAX terminal. She remains silent as photographers surround her to take her photograph. Tonya was arrested for hindering an apprehension — she impeded the government's efforts to locate Ethan by whisking him off to Mexico — a third-degree felony charge that carries a prison sentence of two to 10 years. According to an ABC affiliate in Fort Worth, Tonya, 38, is currently being held on $1 million bond. While his mom was extradited back to the U.S., it could be weeks or even months before Ethan is returned to the U.S. The teen was granted a three-day court injunction in Mexico that will decide whether Ethan has the right to fight his deportation. The injunction could take two weeks to several months to resolve, depending on the local courts and whether or not the Couches decide to seek legal counsel to challenge the deportation. He will also face a judge next month who will decide whether his case will be transferred to adult court. This isn't the same time mother and son have landed in hot water for similar charges. In 2003, Tonya was charged with reckless driving after she forced another driver off the road. She was sentenced to six months of community supervision and forced to pay a $500 fine. In 2013, Ethan drove under the influence and crashed into a broken down SUV, killing four people and injuring several others. He pleaded guilty to four counts of intoxication manslaughter and two counts of intoxication assault. During his defense, his attorney argued that Ethan suffered from "affluenza," a condition that prohibits the teen from understanding right from wrong or the consequences of his actions, caused by a lack of discipline from his parents. The defense succeeded in avoiding prison time for Ethan, who was sentenced to 10 years of probation. If he is tried in adult court and violates his probation again, Ethan could face up to 10 years per death, or 40 years in prison.